Lyon — French Tier VII battleship. A battleship design created before the outbreak of World War I, representing an improvement on the previous Normandie class but carrying enhanced primary armament. The addition of the fourth main gun turret allowed the ship to deliver a unique, 16-gun broadside salvo. Essentially Normandie with a fourth turret superfiring aft, Tier VII's Lyon stands out among ships with the largest (by shell count) main battery broadside in the game; a fact sure to please or frighten any captain, depending on which side of the salvo they are on. However, the accuracy of individual shells is still questionable, as is the AP penetration. Captains should be prepared to switch ammunition types depending on the situation. Like her predecessors, Lyon does not have the most impressive armor, keeping largely the same armor scheme with only a few extra millimeters of thickness here and there. Her firing angles are still poor, and to make matters worse, her turret traverse time and firing range are worse than that of Normandie. This makes it tricky to deploy her firepower without unacceptable risk; captains must wait for opponents to be distracted or reloading before turning to unmask all four turrets. The maneuverability at least is still very good, if not quite to the level of Normandie. Her secondaries are an improvement over her predecessor's already potent array, to the point where even German counterpart Gneisenau would be jealous: 12 barrels on each side, with a solid fire rate and a massive 9% fire chance. Brawling with Lyon is not recommended, however, due to her lighter armor. Unlike Normandie, Lyon can claim a modern AA suite that is one of the best among her tier of battleships; it is several times more effective. 16 guns, providing the best alpha strike and DPM among Tier VII battleships. Devastating against lightly armored targets. Cruisers can routinely be one-shot from full health, and destroyers can lose a lot of health from numerous penetrations and overpenetrations. Fairly small turning circle radius compared to other battleships of her tier. Lowest hit point pool of all Tier VII battleships. Poor armor and very weak torpedo protection. Poor dispersion and the worst sigma values at Tier VII. AP shells are very lightweight and may struggle to deal damage against well armored and/or angled targets. HE shells have lowest fire chance of all Tier VII battleships, and have limited effectiveness in general. This is partially compensated by their large volume. Slow turning turrets. Will often have to turn the ship in order to get guns aimed onto the target. Slower than its predecessor Normandie and generally more sluggish. Hull: Upgrade to Hull (B) for additional hit points, a significant bump up in anti-aircraft power, and faster rudder traverse. Research of this module unlocks progression to Richelieu. Gun Fire Control System: Upgrade to PCA n° 7 Mle 2 for an extra 10% range on the main battery. Propulsion: Upgrading to the second propulsion module increases Lyon’s top speed by 1.4 knots. As with most battleships, Hull (B) is the best place to invest early experience gains in Lyon; the additional health is welcome, and the increase in her anti-aircraft suite is significant. The range upgrade is probably the next best pick-up, followed by the extra speed. Key skills for Lyon commanders include Priority Target, Expert Marksman, Superintendent, and Concealment Expert for the first 10 points. Other important skills to take include Adrenaline Rush as a general skill; High Alert, Jack of All Trades, Basics of Survivability, and Fire Prevention for a survival build; and Basic Firing Training, Advanced Firing Training, and Manual Fire Control for AA Armament for an anti-air build. Premium versions of both consumables are recommended to maximize Lyon’s survivability. 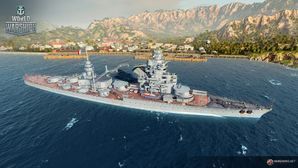 Players who wish to spend doubloons can equip Lyon with Type 17 camouflage that lowers her detection radius, reduces the accuracy of incoming shells, reduces her repair costs, and increases the amount of experience she earns. The Lyon class was a proposed type of battleship which was planned for the French Navy in 1913, with construction scheduled to begin in 1915. The class was to have comprised four ships: Lyon, Lille, Duquesne, and Tourville. The first two were named for cities in France, while the rest honored French admirals Abraham Duquesne and Anne Hilarion de Tourville. The design was an improvement on the previous Normandie class, and mounted a fourth quadruple gun turret, for a total of sixteen 340 mm (13 in) guns. Construction was cancelled due to the outbreak of World War I in August 1914 before any of the ships could be laid down. Lyon’s original 1913 design is missing. As no ships of the Lyon class were never built, both Hull (A) and Hull (B) are hypothetical refits created by Wargaming representing what Lyon might have looked like had she been constructed and served before and during World War II. Illustration of the Lyon class represented in game. Line drawing of one of the proposed designs for the Lyon class. This page has been accessed 63,841 times.